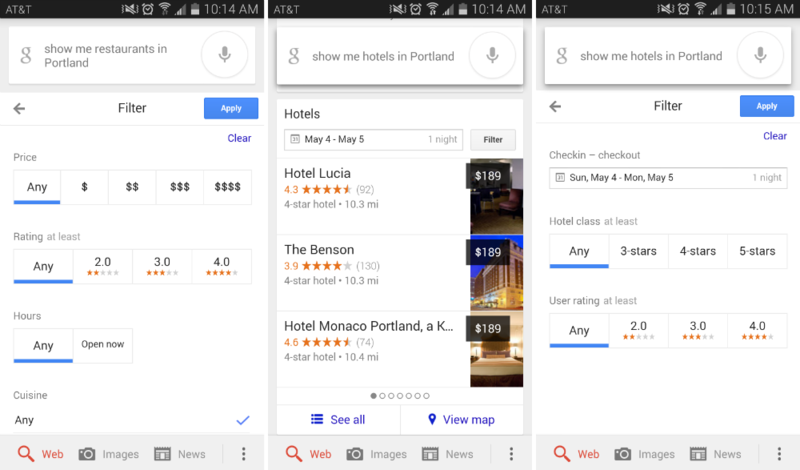 Today, Google has baked a bit more of its Zagat purchase into mobile Google Search results, allowing searchers to use a new filter tool when looking for restaurants or hotels in their city. Starting now, if you say “show me some hotels in San Francisco,” you will get your same list of results, but with the new filter button added in, that allows you to filter the results by date, hotel class, user ratings, and more. The same goes for restaurants, too. If you search “show me some restaurants in San Francisco,” you will undoubtedly see a huge list of many different types of places to eat. Now, you can filter through price, user ratings, type of cuisine, and more thanks to the update. This feature is automatically placed in search results, so there is no update needed for the Google Search app. For now, this is limited to the US only, but Google will look to roll it out to more countries soon.